Well, looks like the National Security Agency's really in die Scheiße with German Chancellor and Glue-of-Europe Angela Merkel: This week, a dual investigation by news weekly Der Spiegel and German intelligence forces, based on documents from Edward Snowden, "utterly substantiated" reports that the NSA was monitoring her cell phone. Merkel was so livid she called President Obama to tell him off — but was promptly reassured that the White House was not listening in. Of course, what's the White House supposed to do? Be all, "Actually, yeah, we were listening in to your phone. That schnitzel delivery you ordered last night sounded super-good, BTW. Still friends?" 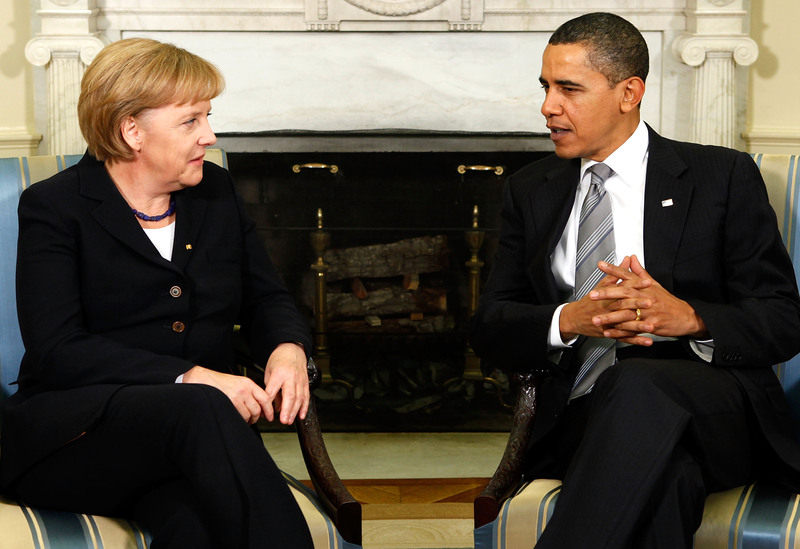 Obama also reassured Merkel during their phone call Wednesday that no spying had been going on. But if it's true, Merkel warned, it would be a "serious breach of trust" and made it clear that such behavior was completely unacceptable, young man. After the phone call, a White House release said that the U.S. government is "is reviewing the way that we gather intelligence to ensure that we properly balance the security concerns of our citizens and allies with the privacy concerns that all people share." Merkel also called on the U.S. to reveal just how big was their surveillance web is in Germany: Allies know the U.S. is spying/has spied on them, but no one is sure exactly to what extent. It could, erm, be pretty big, considering that on Monday, French President François Hollande called Obama to ask him why the NSA was monitoring 70.3 million phone calls, as well as the texts of France's citizens. "The magnitude of the eavesdropping is what shocked us," former French Foreign Minister Bernard Kouchner said in a radio interview. "Let's be honest, we eavesdrop too. Everyone is listening to everyone else. But we don't have the same means as the United States, which makes us jealous." Oh, the French and their jealousy. Last month, Brazilian President Dilma Rouseff cancelled her upcoming visit to Washington after she found out the NSA had been spying on her private communication as well. If the U.S. is supposed to be the guardian of world democracies, etc., it seems like the NSA's turned America into that annoying parent who listens in on their kids' phone calls.